"Look, I want ravioli. I came here for a balanced three-course meal: ravioli, ravioli, and ravioli. Is that clear?". Quite right, Reggie. 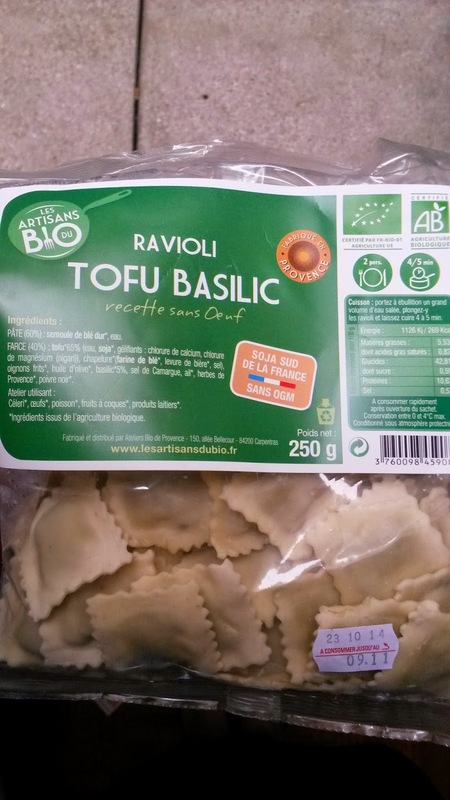 Unfortunately I only have two ravioli courses to tell you about today, but on the plus side, they are both vegan, organic, new to me, and available in Paris. The first ones are these little tofu and basil guys by Les Artisans du Bio. I found them in the excellent all-organic Carrefour at Gare de Lyon. And here they are all cooked, dressed with pesto and nutritional yeast. Honestly, I was disappointed. The pasta is quite thick, and the filling doesn't taste of much at all. Oh well. Luckily, we're following Reggie's example, so have a second ravioli course today. These ravioli are huge. 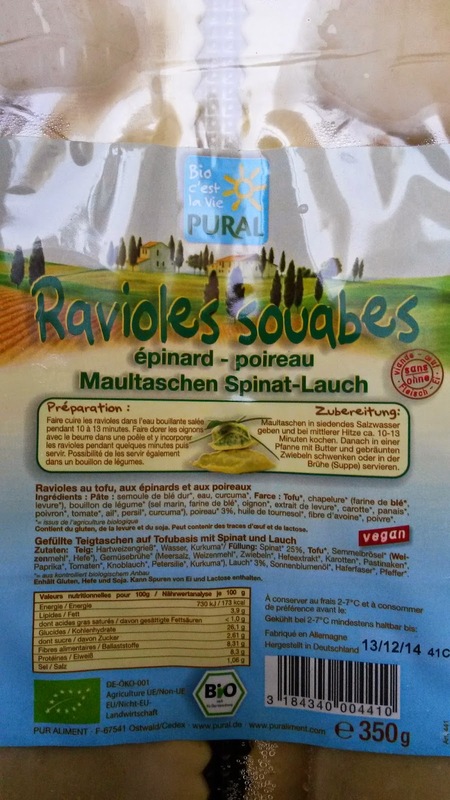 They're really Maultaschen from Swabia (Germany), but are being all pan-European and calling themselves ravioli here. They come from Pimlico, a little organic shop round the corner from me, and are made by Pural. 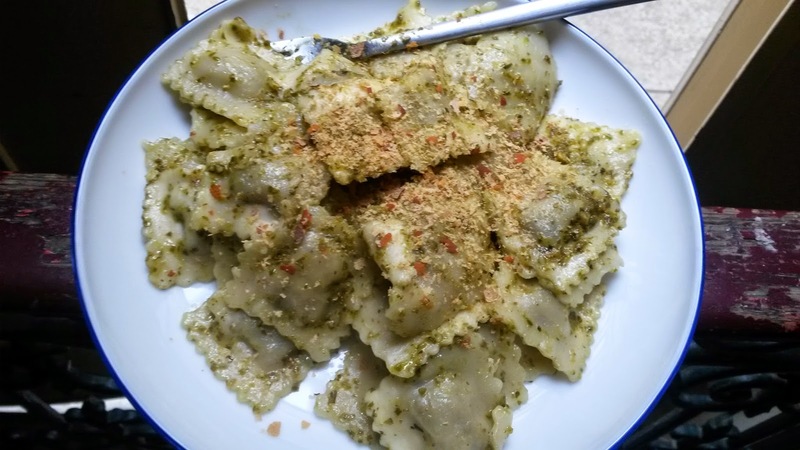 A vast improvement on ravioli course n° 1. 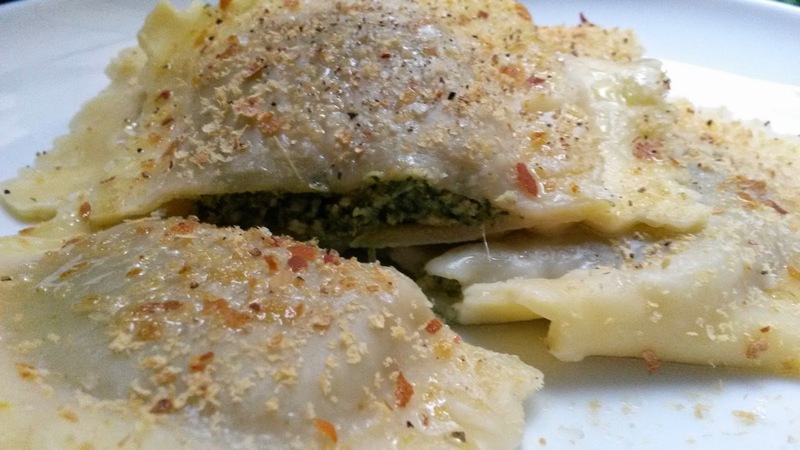 The spinach and leek combination in the filling tastes, to me at least, like wild garlic. And wild garlic is bloody delicious. The pasta itself is nice and thin, but coped fine with a fairly long cooking time. They're so big that you only really need two, not three, per portion. They're also 'supposed' to be served floated in a broth, or with fried onions. But like Reggie, I'm not one for eating what I'm supposed to, so there. Here's a money shot for you. 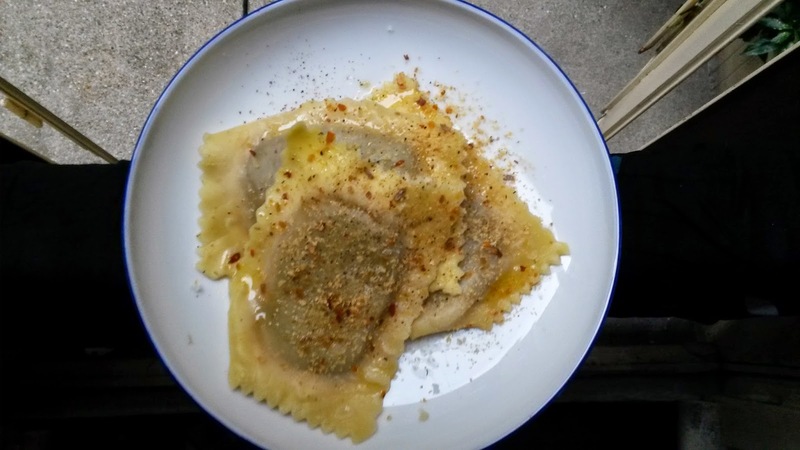 Any suggestions for a third ravioli course?